What a year it’s been, and what a month December has been! 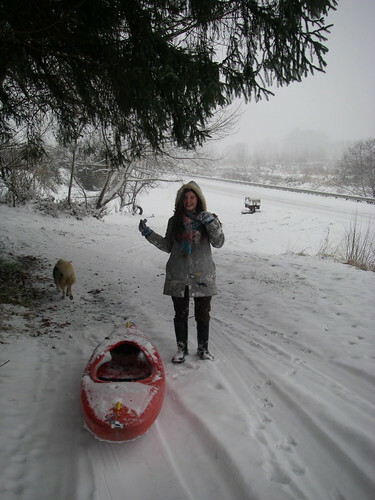 Notable events for December include the bankruptcy and closure of Skamokawa Center, where much of our kayaking work was based, and where I have worked managing the paddle center for five years. In fact, five years is the longest I’ve ever worked for the same organization. Columbia River Kayaking, the LLC that the guides formed in 2007, is now scrambling to find ways to replace that income and hopefully keep some of our programming going in some other form. All that snow that we were playing in back on December 20th? Well, an awful lot of it is still here. In fact, it snowed almost continually through Christmas Day, which resulted in our back porch roof collapsing under the weight of about 20 inches of snow on Christmas morning. The light-duty, almost flat roof was never intended to hold up that kind of weight. 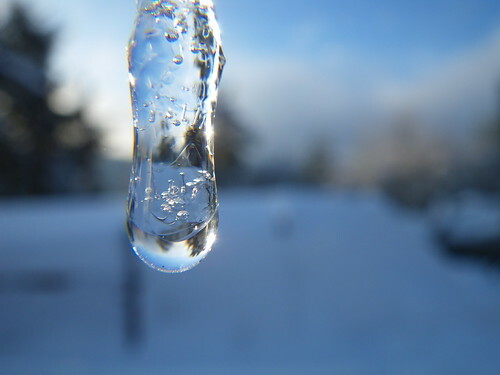 On Christmas eve, it had started to thaw and rain a little, but during the night it switched back to heavy snow. 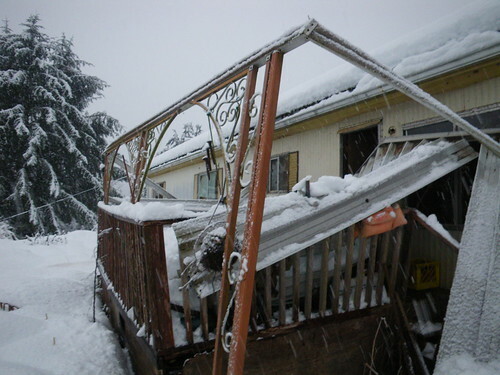 I did manage to save the front porch roof by climbing up a ladder with a snow shovel and clearing it off. 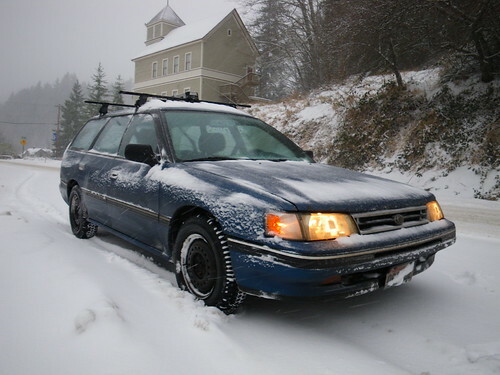 Thankfully, the Subaru wagon did remarkably well in this weather. 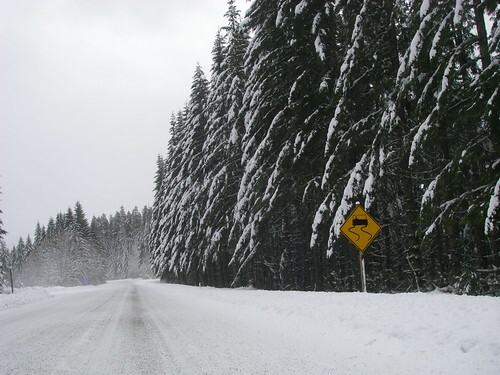 With it’s all wheel drive and studded snow tires, I was never unable to go where I needed to go. The only place I got stuck was in my own driveway, trying to break out of the deep snow that had accumulated the night before. My driveway is finally clear down to the pavement though, even though the rest of the land is still covered. I hiked up to the back of the land this afternoon and was still finding snow deep enough to go over the tops of my rubber boots. The heavy snow did a lot of damage to the fruit trees and shrubbery near the house, and I wanted to see how the forest had fared. There wasn’t a lot of damage up there, mostly small hemlock and spruce trees bent over and some breakage in the wild cherry and alder. 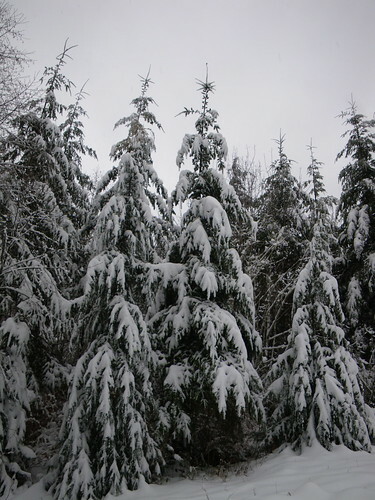 My Port Orford Cedars and Redwoods will need to be dug out of the snow and propped back up again, though. I’m hoping I can save them. There were elk tracks everywhere, and evidence of them resorting to eating the usnea lichen off of the trees wherever they could get to it. I’m sure they will be glad when this snow finally thaws away. At least one of the feral bunnies is still alive though, having holed up in the empty barn and successfully foraged under the trees. Yesterday was the annual Christmas Bird Count. I was feeling a little under the weather and didn’t go out for a full day, but went out for three hours, and paddling about eight miles. There were a lot of duck hunters blasting away in one of the most likely sloughs, so I avoided that one. And there was a cold east wind blowing, too, so most of the little perching birds stayed low and out of sight. But I still managed to get 19 species, mostly waterfowl and a few raptors, and I hauled a pile of trash out of the tidal area of Welch Island. 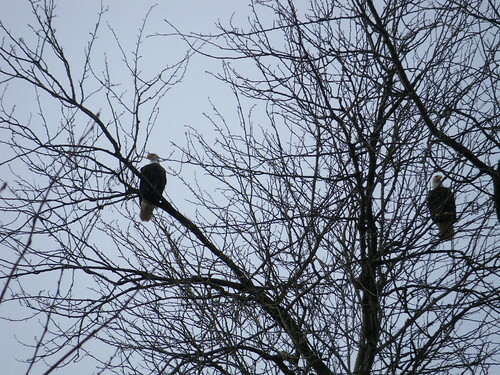 These bald eagles let me paddle right up underneath them. Well, that’s that for 2008, there’s only a few hours left now. Here’s hoping for positive change, health and prosperity in 2009! 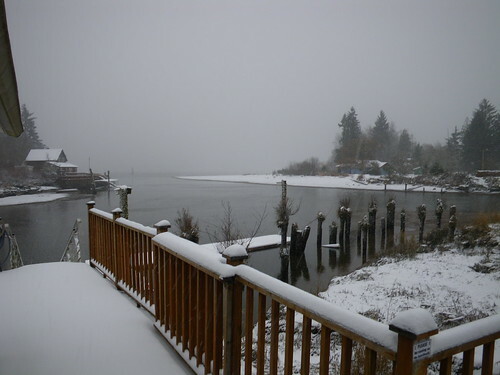 So, it doesn’t often snow this much in Skamokawa, but today I’ve had several inches of snow on the ground for days already, and more is predicted to arrive this afternoon. It is already about seven or eight inches deep in the pasture. 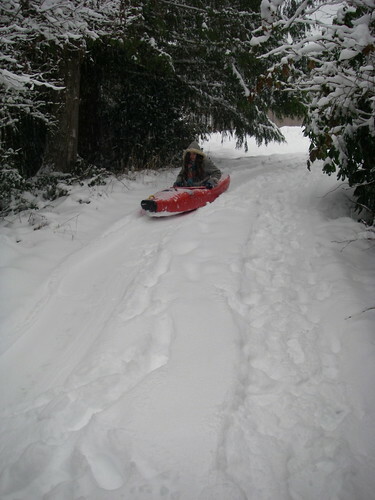 Alice and I went out to do some sledding, which usually gets done with garbage can lids at my house. 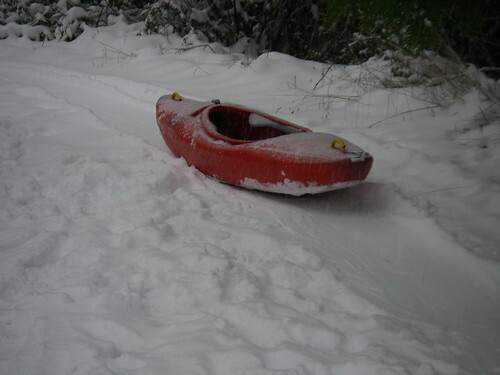 When it rarely snows, you don’t own a proper sled. 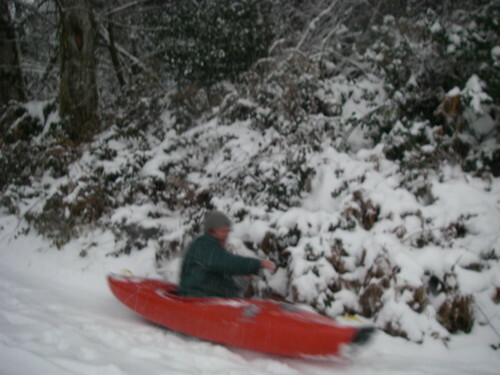 So we were scrutinizing the garbage cans again, when I suddenly remembered the whitewater kayaks! 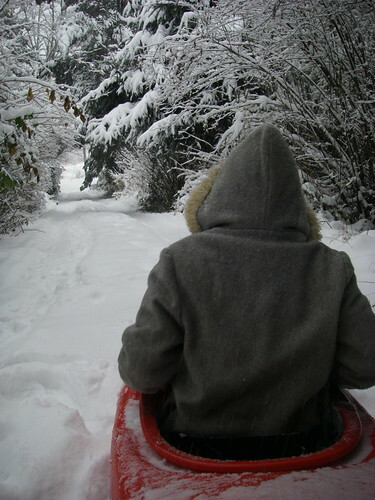 Perfect sledding substitute! It took a couple of passes down the driveway to get the snow nicely packed down, but then it worked very well. Too well, almost! On one pass Alice ended up under a rhododendron bush covered in snow, and on another pass she ended up in the ditch by the road, having just missed a small alder sapling. Already being a kayaker, I knew a little better how to steer by leaning and bracing, but having no paddle, I used my bare hands for bracing, which worked alright until my last run, when I hand braced into the blackberry bushes on the side of the driveway… and then ended up flipping over at the bottom while leaning a little too hard trying to avoid the ditch. All in good fun…and I’m still picking blackberry thorns out of my hands. I started out the day in Astoria, at Shannon’s house, having been there the night before to see Opal’s first band concert at school. She is learning the snare drum right now. My plans involved going to see my friend Don Beale, in Manning, OR. Our task was to make a few Greenlandic harpoons, for practicing and competing at the annual SSTIKS event. 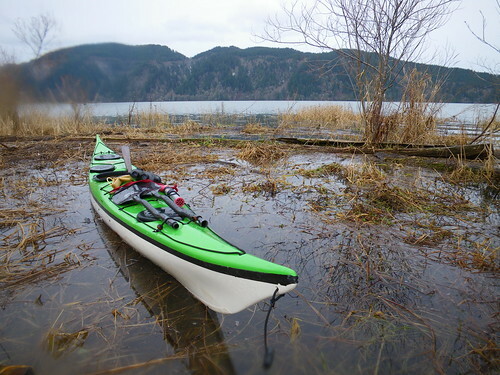 Then I was going to go on to Portland that evening for the OOPS kayaking club meeting where I was asked to come and promote the kayaking business at their annual enticement event. What I didn’t realize though, is how snowy the coast range actually was. My 20 year old VW Jetta was not really the ideal vehicle for this kind of driving, with its old, balding tires and lack of all wheel drive. But I just kept poking along, rarely getting out of second gear, and I made it all the way through the snow without incident. It must have been twenty miles or so of snow covered roads! What a well placed sign this one was. Slippery indeed! 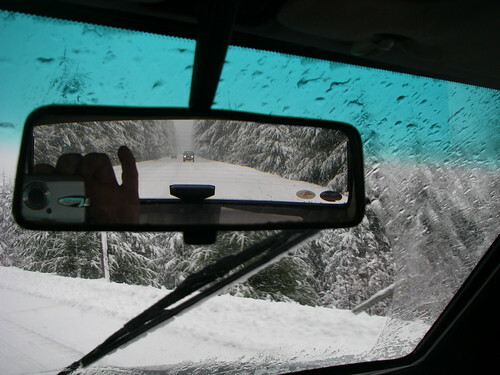 But when I turned off the highway, I suddenly was in deeper, softer snow, on a steep winding road. The car started slipping and then, there I was, stuck in the middle of the road. A couple of more tries, and suddenly my transmission was finished. No warning, no reason to believe that there had been anything wrong. It just stopped transmitting power to the wheels, and started instead making an unpleasant grinding noise. I think the ring and pinion actually broke. My $700 car, after 271,000 miles, came to a halt. Bummer! What wasn’t a bummer though, is that I was actually only about 100 feet from Don’s house, and the driveway I was stuck in front of was his in-laws’ house. He came down and helped me roll the car into their driveway, where it is sitting right now. We went ahead and spent a couple of hours carving harpoon shafts and visiting and then headed into the city to the kayak club meeting. Did I mention that he was also going to the same meeting? What luck! Don took me out to lunch at Sushi Town, my first experience with one of those conveyor belt style sushi joints. There is a little conveyor belt with different sushi and desserts and so forth that goes all around the restaurant, and when something you like comes by, you pick it off the track. The plates are color coded for pricing, and when you are done, the lady comes by and counts up your colored plates and gives you the bill. It was fun to watch the sushi going around and around. I wish I had thought to take some pictures! Anyway, we made it to the meeting on time, and afterwards, Don was kind enough to drive me up to Longview, and Shannon was kind enough to come over from Astoria and drive me back home. Tomorrow I head back to Don’s house with the truck and flatbed trailer to haul the poor car home. Whew!